(Bloomberg) -- Mexico kept borrowing costs unchanged as mounting debt at the state oil company threatens to undermine confidence in the government’s finances even as the consensus sees inflation moderating. The central bank, led by Governor Alejandro Diaz de Leon, kept the benchmark rate at a decade-high 8.25 percent, in line with all 26 economists in a Bloomberg survey. Analysts had also unanimously forecast a hold last month. More recently, the U.S. Federal Reserve this week slashed its projected interest-rate increases for this year to zero from two. Slowing inflation, a stronger currency, a dovish Fed and forecasts for weaker growth now have economists and investors pricing in Mexico’s first rate cut since 2014 for as soon as mid-year. However, in the statement accompanying its decision, the central bank said inflation risks persist while market uncertainty has been prevalent, pointing to a more hawkish stance than some in the market expected. The statement was unexpectedly "more hawkish than neutral," said Marco Oviedo, chief Latin America economist at Barclays Plc. "The effects of the persistence of core inflation on inflation expectations is still a concern." A key reason rates are remaining steady at all is because Petroleos Mexicanos, the world’s most indebted oil major, could trigger a sovereign rating downgrade that could in turn spur capital flight and peso weakness, according to JPMorgan Chase & Co. In its statement, Banxico said risk factors associated with the economy -- such as credit ratings for Pemex and sovereign rating -- have led to discounts in Mexico assets. 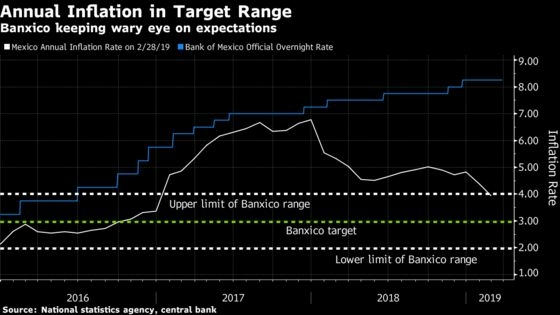 The central bank "needs to anchor inflation expectations now," JPMorgan Mexico’s chief economist, Gabriel Lozano, said before the decision. "As long as uncertainty on the new Pemex plan reigns, policymakers have reason to remain concerned, given the current risk of a downgrade." Lozano doesn’t see an interest rate cut until next year as labor unions push up wages with job actions and salary demands, which may trigger inflation. Most economists, however, expect rates to start falling in November, according to the median estimate in a Citibanamex survey. They also foresee inflation falling to 3.70 percent by year-end, and the economy growing only 1.5 percent, down from 2.0 percent last year. In early March, S&P Global Ratings lowered its outlook for Mexico’s sovereign debt to negative from stable, saying the nation’s shift to limit private sector involvement in energy could lower economic growth prospects. The outlook shift on its BBB+ rating followed a two-notch downgrade by Fitch Ratings for Pemex to near junk. President Andres Manuel Lopez Obrador has attempted two Pemex rescue packages, but neither has convinced markets. A third attempt will be presented in about two weeks, which will likely include up to $7 billion in aid from a rainy day fund to help pay down debt. Banxico also aimed some of its comments at the new government: "It’s important to promote the adoption of measures that help an environment of confidence and certainty for investment, more productivity, and a consolidated sustainability in public finances."